"Best friends, social trends, and occasional murder." Heathers was a black comedy that came out in the year of 1988. It helped to boost the careers of its young stars and has become a cult classic that has withstood the test of time. The story centers around four teenage girls in high school. These girls are the most popular students at Westerburg High School. They are both loved and hated. Three of the girls in the group are named Heather. Veronica is the one girl in the group without the name of Heather and she is tired of hanging out with the three Heathers. They are mean and nasty and Veronica misses her old life before she became their friend. Veronica is intrigued by the new guy at school, J.D. He has the guts to stand up to bullies and she wishes she could do the same to the Heathers. Veronica enlists J.D. 's help after a disastrous party that leaves the leader of the Heathers, Heather Chandler, vowing to destroy Veronica. J.D. and Veronica show up to Heather Chandler's house the morning after the party and J.D. offers her a drink that is supposed to cure hangovers. Little does Heather know but the drink is actually drain cleaner and it ends up being the last drink she'll ever have. After Heather Chandler dies from the drink of death J.D. talks Veronica into forging a suicide note for her old friend/nemesis. The movie takes off on a very dark ride at this point and it is not for the faint of heart. Some people may find the nonchalant violence disturbing while others will appreciate the dark humor. If you are willing to give it a try you will be taken on a murderous adventure that will threaten to take down more than just the snobby elite Heathers but will threaten to destroy every kid at good old Westerburg High School. Who will be left standing in the end? 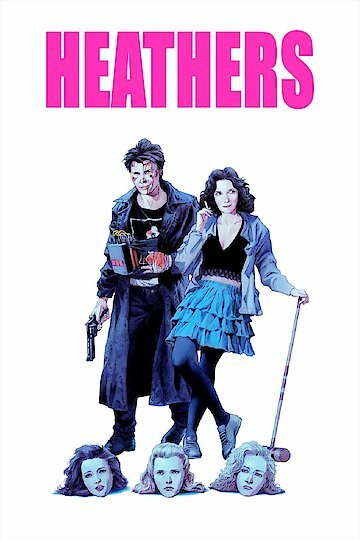 Heathers is currently available to watch and stream, download, buy on demand at Amazon Prime, Hulu, Netflix, Amazon, Vudu, Google Play, FandangoNow, iTunes, YouTube VOD online. The new anthology series will be based on the 1998 movie.